When I think of guys presents I think of useful gadgets, accessories and toys. Clothes aren't something I find all men are into and I'm trying to make this an all rounder in terms of gifts. Aftershave is always a winner though I haven't placed it in this gift guide, but that's because it's an obvious winner, along with big big presents like a game's console, jewellery and watches or little things like socks, chocolate and bathroom gift sets. Slippers aren't something all guys wear, but I think if you get them the right ones, they might never get out of them like these beauties from Next. I think they're amazing for the fluffiness of course, but they're quite shoe like and less slipper looking, and also very gentleman looking too. Keeping along with the lounge theme, I picked the iBed lap desk because why not!? If you're man had an iPad or a tablet I'm sure he'd appreciate a better way of being lazy in bed and somewhere to set his tea down for those amazing Sunday mornings in bed! And if he's getting up to get ready he'll probably love getting his shaving things or shower gel out of a very gentlemanly leather wash bag... personalised too of course! Scarves are always a winner if the man in your life likes accessories, and if you're trying to give something a little more personal and meaningful, wouldn't a personalised engraved bracelet be nice? I bought one of these for my boyfriend for an anniversary and it looks lovely! It's not too 'OTT', it's really simple but holds a lot of sentimental value at the same time. 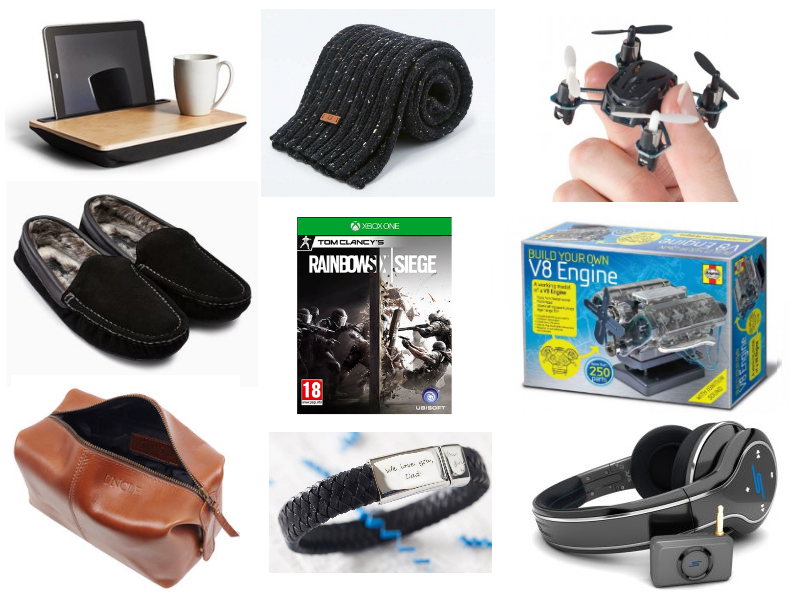 Next moving on to more gadgety things, there's without a doubt every man loves a good toy or gadget to play with, which why the quadcopter is definitely on this gift guide being the newest craze for Christmas presents this year! Quadcopters are fun to play with and probably a lot easier than your wobbly helipcopter you keep crashing into the Christmas tree or spinning on the spot. If the guy you're buying for is more handsy, he'd probably love something to build like this V8 engine! Another present I bought my boyfriend in the past that he enjoyed making so I know it could be a winner for your car fanatics or handy men. Last but not least, if you're guys a music lover a pair of headphones would probably be lovely - but over the head ones. They're easier than poking in little tiny ear phones, as well as being more comfortable and easy to find! And he'd also love them if he was a gamer and it had a little mic so he could talk with his friends whilst playing the new Rainbow Six game which is probably top on any guy owning a Playstation 4 or XBox One! For all girls out there possibly reading this, I hope it helps! I know there are a lot more things out there for so many different types of guys but I tried to base mine around what every guy might like to get. It's a very generic list, but still! I've actually finished my Christmas shopping - surprisingly! And I wish I'd seen a couple of these before... But maybe I can save these ideas for next year. It always helps to look back!